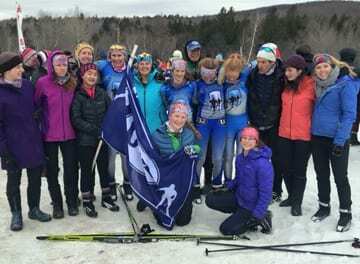 The U-32 girls Nordic ski team had felt the bitter taste of finishing second at the Division II state championships the past two winter campaigns, watching as Woodstock celebrated back-to-back titles. Both schools were on a collision course once again this season, returning the majority of their scoring rosters from a year ago. However, U-32 was forced to overcome an obstacle when both days of the state championships were moved to Rikert Nordic Center in Middlebury due to lack of snow earlier this month. Rikert had enough artificial snow to hold the meet, but it’s also where Woodstock often trains during the season. U-32 had not been on course since the last state championship meet. In Tuesday’s Freestyle meet, Woodstock handled the icy, downhill corners well, while U-32 had several skiers suffer falls in the 5K Freestyle. Still, the Raiders’ depth and a strong race by senior Eliza Merrylees allowed them to claim a slim victory in the 5K race, despite Woodstock’s Abby Kaija winning the race and two other Wasp skiers finishing in the top 6. U-32 took that early edge into the afternoon sprint relays as Merrylees held off Kaija in the final leg of the relay to maintain U-32’s lead halfway through the state meet. Two days later, the teams faced off again at the Classic State Meet, where U-32 owned an 18-point lead over the Wasps. U-32 coach Mark Chaplin said he was a little worried due to increased icy conditions and needing to figure out the proper waxing for the skis. He claimed they might not have used the best combination, but you couldn’t tell based on the results of the two races. The Raiders extended their lead to 23 points after the 5K Classic. Rena Schwartz (16:11.4), Rebecca Thompson (16:30.1), Ruby Lamb (16:51.9) and Emma Curchin (17:06) all finished in the top 11 racers, once again showcasing the team’s depth. That left U-32 in prime position to take home its second state championship in school history and first in 7 years. In the final race, Woodstock opened a 23-second lead after the first leg of the relay. Schwartz, a sophomore and U-32’s top skier this year, caught her Woodstock opponent in the third leg and created a 30-second cushion for the Raiders. Once again, Merrylees protected her team’s lead in the final leg and ended her high school career as a state champion. “We’ve had a lot of great skiers but this is the most talented group we’ve ever had,” Chaplin said after the championship meet.